After years of failed attempts to recapture Wolverine, Weapon X had decided to change direction, and employed a sub-organization dubbed The Facility with creating a clone from a damaged DNA sample. Dr. Sarah Kinney eventually came up with the idea of using the salvageable X-chromosome to create a female clone, she was denied, but still went ahead with her plan and was successful. 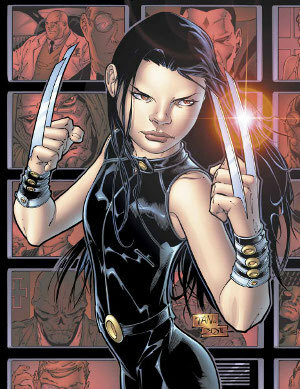 As punishment for her insubordination, Kinney was forced to be the surrogate mother, and thus gave birth to X-23, after 22 earlier attempts at producing a clone failed. X-23 was trained to be a killing machine from birth. She was trained extensively for years in the art of assassination, under harsh conditions with severe punishments for failure, or simply for not excelling. Eventually she was sent out on missions across the globe, her services offered for the highest bidder. With her mother, Dr. Sarah Kinney, dead by her own hand, Laura was faced for the first time with a lack of purpose. All her life she was told what to do and when, and she did it without question. Now she had to make her own decision, and the very first one was to survive and evade The Facility so she never has to go back there. Laura's own escape was orchestrated by Dr. Sarah Kinney and given to her under the guise of a mission. Otherwise, Laura would have never escaped. With no purpose, and no one to give her orders, she wound up a vagabond, only staying in one place for a short time before moving to the next. When she arrived in New York under the guise of a runaway teen, she fell into the clutches of Zebra Daddy, a local pimp who recogized the 'lost' quality in Laura and by sheer happenstance he struck gold by giving her purpose and giving her a new mission objective. Using language that appealed to her upbringing, Laura became one of his prostitutes, her expertise with blades used for an entirely different reason. One thing for sure, Zebra Daddy's crew was the last place in the world that the Facility would ever look for her. That all changed the day Kiden Nixon and her crew gang of homeless powered teens crashed into Laura's life. Kiden had a vision that lead her to a room where a customer of Laura's killed himself. She thought she was saving a poor helpless girl from the clutches of a pimp. What Kiden didn't realize is that for the first time she taught Laura a lesson she needed to learn. Laura Kinney didn't need to listen to anyone, she didn't need to serve anyone. She wasn't just a tool, a weapon, for others to use. She was a human being. Naturally, the newly found friendship paid off when Laura obliterated Zebra Daddy when he tried to take out Kiden at a later time. For a while Laura kept company with Kiden to keep her newly found friend safe, before she caught on the Facility spying on her and moved onwards. But then something happened, with the end of the Secret Wars, Laura shifted into Earth 616, a world where she was supposed to be much older, and an X-Men. The immediate benefit was that the Facility wasn't likely to look for a 16 years old, when she was supposed to be in her early 20s. But the X-Men, were all strangers, and Laura didn't know what was this Xavier Institute she found herself shifted into. So she did what her instincts told her, runaway from the Xavier Institute unseen, and managed to make her way to Mutant Town, she wonders if she can find her friend Kiden again. But if not, she will try to make out her own life, trying to learn to become truly human. The one final revenge she could have on the Facility on behalf of her mother. Laura is not used to being around people, and social interaction is a foreign language to her. As a result many things irk and irritate her and to normal society she seems strange or ill mannered. She's prone to getting cross and deciding to hurt people. After all, hurting people is what comes natural to a trained killling machine who was raised for that singular purpose. If she ever would be forced to go through cheerleading trials, that would be one thing she would fail misreably. She's not a happy person and people find it hard to read her or relate to her. X-23 was created and raised to be one thing, a perfect killing machine, and through rigorous training, harsh treatment bordering torture and total denial of outside news, she became just that. Violence is second nature to her, and she's much more comfortable around it than she is around every day mundane settings. She can end a life without blinking, and never feels remorse for a kill. She doesn't understand the concept of being better than the bad guys, to her it's simple math, eliminate the source, end the problem. As a clone of Wolverine, it's little wonder that Laura is a feral creature. She growls, she stands her ground and will fight for her personal space, and most importantly she likes to slash with her claws. She is badly lacking interpersonal skills, because she was never taught them. Children emulate their parents and other grown ups, her only example were holograms of Weapon X and her various instructors for fighting and assassination arts. If someone bumps her in the street, she will not let it slide. Laura has a strange perspective on the concept of humanity. She sees herself as a weapon, a killing machine, a tool that was used by the Facility and others to eliminate undesierables in impossible locations and demanding time restrictions. She hates the thought, and much like in the story of Pinocchio read to her by her mother, she would like to stop being a puppet and become a real human. But having lived her entire life as a killing machine, not a person, she doesn't understand humans despite wanting to be just like them. At times she tries to belong, at others she's willing to go on a berserker rage and tear everything apart. She tries to make sense of it all, further exploring and overcoming her love / hate attitude towards the world she is trying to belong to. A huge majority of Laura's life was dictated by The Facility and her handlers. It was not her own. She was a weapon, a tool, a puppet. She has had enough. She wants to become a real human, she wants to call the shoots in her own life. She doesn't want to be controlled by other. To that end she is trying to go against her nature, trying to blend with society around her, but for the most part she fails misreably. Nevertheless, it is a strong motivation for her. Laura wants to live up to her name, her new name, Laura, not the designation more fitting of a weapon or an assassin X-23. A lot of people in the world of the underworld knows just who X-23 is, not in person perhaps, but they know if they need someone killed they hire X-23 from the Facility. Nobody really knows who Laura Kinney is, for once, she was the only one present to hear Dr. Sarah Kinney name her before she died (by Laura's own hand no less). Laura was very proud to be with a name of her own, but it's incomplete, it's a meaningless collection of syllables. She wants to find the person behind the name, who she could become, if she ever manages to tone down her feral instincts and killing reflexes. Most of all she wants to avoid ever having to serve another Master, be it a scumbag like Zebra Daddy, or a black ops operation like The Facility. 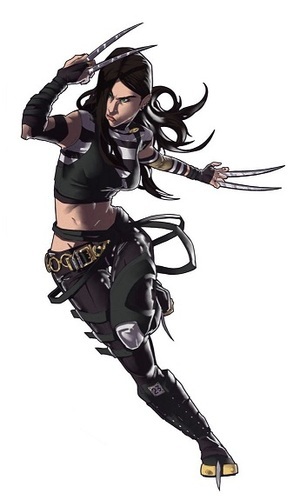 X-23 has natural bone claws, two sheathed in each forearm, and has one in each foot. Courtesy of The Facility and the Weapon X program, these claws have been completely coated in adamantium, a rare metal that is essentially unbreakable, and these claws are able to cut through almost every other known material like a hot knife through butter. Much like Weapon X himself, X-23's mutation comes in the form of an incredible healing factor. In truth, this ability has proven to be even more potent than her predecessor's, though the disparity is largely attributed to the fact that her entire skeleton is not covered in adamantium, which means her power is not constantly working overtime every second of every day to keep her alive through that abnormality. Laura is capable of re-attaching severed limbs, or even regrowing them. 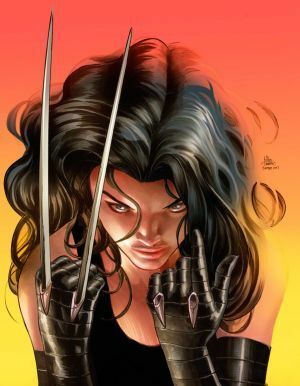 X-23 is also immune to almost every known disease, toxin, poison, and anything else of the sort. A side effect of her Healing Factor, spawned by the rigorous, inhumane training The Facility put her through, Laura's body is capable of feats beyond her size, and flat out beyond human capability. Her reflexes, dexterity, and agility have all been honed to the literal breaking point and beyond, only enabled due to her incredible healing forcing her body to permit the feats. She's also far stronger than she appears, due to the healing factor constantly regenerating muscle tissue, and she is able to lift roughly 800 pounds. The rate at which she heals also allows her to endure blows from drastically stronger opponents without being immediately out of the fight. The Hulk might knock her half way across the city, but she's going to get back up pretty quickly. Laura may not be quick enough to dodge a bullet at close range, but anybody (even multiple anybodies) without similarly enhanced reflexes has little to no chance against her in melee combat without some other factor coming into play. X-23 has increased senses, her sense of smell being the strongest of them, with her sight and hearing and the others not far behind. Most notably, this trait displays itself in her ability to tell who is approaching her just based on their scent, assuming she knows the person. X-23 was as close as it gets to being a lab engineered assassin, her life revolved solely on completing assignments at increasing odds under impossible time constraints. Once she has an objective or goal in mind, nothing will sway her from completion. She will suffer unbearable conditions, she will suffer torture, having her healing factor to help is one thing. But the capacity to suffer through the pain unflinchingly, along with her stamina and steadfast approach makes her very difficult to handle. Aside from getting away alive, Laura also escaped from The Facility with the clothes on her back. Fortunately though those cloths were in the form of a uniform made of unstable molecules. As such the main part of the outfit, a sleeveless jumpsuit is highly resistant to damage and makes her harder to detect by various methods, as well as providing some warmth. On the other hand her boots not only provide that, but have a unique 'self sealing' tow area thus allowing them to 'fix themselves' after her foot claws are used. Aside from actually being trained to track prey, Laura's incredibly keen sense of smell alone makes her one of the world's best trackers. Laura was created and trained to be the ideal assassin, or to be more exact, a living weapon. As such she not only was trained at, but exceeds in being stealthy, tracking, survival, disguises, security, and even spying. She is also knowledgable in regards to conventional and electronic infiltration as well. Since many of those skills are useful in her being able to get where she needs to, and do what she needs to do, The Facility rarely held back when trying to teach her these skills. One way they did hold back though was to make sure that these skills were specific to infiltration, espionage, and assassination, as such she can do basic stuff not directly involving things like computers, and may be able to defeat computer related security rather easily at times, but other things like troubleshooting and repairing broken computers is beyond her grasp. Those limitations do translate over into other areas as well. Laura is able to perform at, and above, Olympic level in many forms of athletics. She can form seemingly impossibly acrobatics and gymnastics, as well as run faster and jump higher than humanly possible due to her enhanced physique. Laura can speak fluent English, French, German, Russian, Chinese, and Japanese. However, due to her harsh upbringing and lack of interpersonal skills, she tends to come off as odd, blunt or overly aggressive in her choice of words. There's one thing that Laura truly excels at. That's fighting. She was simply put, raised and trained to be a killing machine. As such she is a highly trained hand to hand combatant who excels in many forms of armed and unarmed forms and combat styles. Thus she is not just a competent and dangerous opponent when fighting, but when you mix in things like her healing factor, her heightened senses and reaction time, her peak physical condition and above-human agility all combined make her something almost beyond deadly in close combat. Laura is not just deadly in close combat. That's just where she's at her best. She was also highly trained with things like guns, other long range weapons, and explosives. Which when mixed with her heightened senses and reaction time, her peak physical condition and above-human agility she can be considered very deadly with a large variety of ranged weapons should she need to use one and have access to one. X-23's former handler when she was a tool of the Facility. Laura has undergone extensive torture, both physical and mental under the hands of this woman. Kimura's mutation renders her impervious to even adamantium, which results in a pretty bad day for Laura, and this woman and the Facility would be all too happy to get their hands on X-23 again. X-23's stint as a globe-trotting, brainwashed assassin killing off political figures did not go unnoticed by world authorities, and at least some of them, like SHIELD, are aware of X in detail. When you're raised to be a weapon by people who refuse to view you as a human being, you tend to develop issues. One of the better known ones is how unstable Laura can be, and often is emotionally. While normally she does tend off to come off as somewhat emotionless, all it can (and often does take) is certain stimuli to set her off in extreme ways. And when she does go off it often takes a lot of effort for Laura to keep her reactions in check. Things that set her off include laboratories, hospitals, doctor's offices, and almost anything that could remind her of The Facility. More often than not her reactions tend to be destructive, or self destructive. While 'freak outs' have been known to happen, pure rage or depression has been noted too, often in ways that are self destructive (such as by cutting herself with her own claws for example). The Facility wanted to make sure that they could cause Laura to kill no matter what. As part of this effort they created a 'trigger scent'. This 'scent' is actually an artificial pheromone that when Laura inhales it, she becomes a berserk killing machine with no self control. She can and almost always will kill anyone and everyone nearby when in a state triggered by this scent. And when the rage subsides (usually after just a few minutes) she will retain partial and/or vague memories of what she did while in that state. It tends to go without saying that when you're a 'clone' of someone else you tend to have identity issues. The same goes for Laura. But on top of that, she's the clone of Logan a.k.a. Wolverine a.k.a. 'The Best There Is'. As such she not only has mixed feelings about him, ranging from curiosity regarding him, to anger to the part he played in her creation. On top of that, since she was created as a weapon, she not only struggles with what she was created and trained to be, a 'perfect killing machine', something that she flat out doesn't want to be, even though she knows that's exactly what she excels at doing. Add to it the fact she is in a world where she is supposed to be older and have an entire history unfamiliar to her? Well…she just might think she's going crazy. When you have giant hunks of metal surgically grafted to your body, there are some down sides that come along with it. Some of the more minor issues involve being ten pounds heavier than you look. Other issues involve things like the metal being detectable by metal detectors or even super powered individuals who have magnetic powers. On top of that her healing factor is actually a bit weaker than it would be if she didn't have adamantium in her body. And those are just some of the more 'common' down sides to Laura having her adamantium claws. There are always other ones that could crop up because of the rare and valuable metal inside of her. From birth Laura was trained to be able to operate alone, no matter what the circumstances. On top of that the few people she has truly felt close to in her life like her mother and her sensei have unfortunately died at her hands. As such she has very limited experience interacting with others, and often feels compelled towards solitude. To be honest she wants to be part of something, but she doesn't really know how to do it. Worse because she views herself as a danger for others she's prone to wandering off by herself for extended periods of time with no warning. This X-23 from Earth 603 is very simmilar to the 616 X-23, only difference is she's younger and hadn't met the X-Men. So while there's slight variation, she is still world famous in underworld circuit as one of the top assassins money can hire. Unfortunately, as the Facility lost possession of her, she went off grid. Logs tagged with "x-23" or "re:x-23" will appear below automatically. Logs from before February 9th 2017 are from a previous player of the character.